An impoundment of the Withlacoochee River, as part of the original Cross Florida Barge Canal project, this large lake is full of cypress trees, hyacinth and pennywort islands and sometimes hydrilla. Abundant cover and structure grow plenty of bluegill, redear sunfish, catfish, black crappie and largemouth bass. The deeper river channel is always good to locate and fish underwater bends. The rest of the lake is referred to as the “flats” or the backwaters. This 157-mile stream originates in Green Swamp in Hernando County and flows north to the Gulf at Yankeetown. The stream has many limerock areas and associated swamps. Water levels fluctuate except in Lake Rousseau and the area just above the influence of Rainbow River. Water color is dark during the rainy season and clear during low water. Public ramps are located at S.R. 44 in Rutland, C.R. 470 north of Lake Panasofkee, the Outlet River west of Lake Panasofkee on C.R. 470 in Sumter County, C.R. 39 north of SR 200 in Citrus County, U.S. Highway 41 at Dunnellon and SR 40 at Yankeetown. These two bodies of water make for some excellent trophy bass fishing as bass from 5 pounds or better are commonly caught, with great catches of 10 pound plus bass. 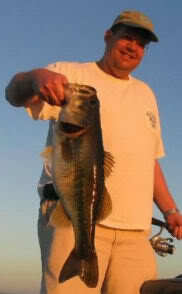 Doug Hannon himself has caught well over 300 ten pound plus bass in these waters. The waters of the Withlacoochee River are crystal clear which makes for great sight fishing, spoons, little George and Gulp Sinking Minnows have produced great catches, as well as the dominate bait of choice, Large Wild Shiners.